Moving large appliances is difficult, especially when you don’t want to mess up your floors. Whether you have laminate, carpet, tile or hardwood, it’s essential to move your refrigerator carefully to avoid scratches, rips, and tears in your flooring. Here’s an overview of the tools and tips you need to relocation this large home appliance without damaging your floors. To create your moving day plan, take measurements of the refrigerator and the different pathways you will use. It’s possible that parts of your home can’t accommodate the fridge due to narrow doors or hallways, so something like a sliding patio door may have to serve as an alternative path. Having the measurements and a game plan before you start the moving process will save you some major headaches. Once you have established your plan, it’s now time to prep the fridge. Remove the contents of the fridge and giving it a thorough cleaning. It’s advisable to defrost the refrigerator approximately 24-48 hours before your move. Make sure it is thoroughly dried and food-free to prevent the build-up of mold and mildew. Once it’s clean, secure the door. You don’t want to have the door fly open when you are trying to maneuver it. It is also essential to make sure the shelves inside are secure. Alternatively, you could remove all shelving and wrap it separately with packing paper and bubble wrap to ensure it doesn’t get dislodged and shattered. Removing these parts its recommended if you are contemplating a long-distance move. Before moving the appliance, you should also secure the power cord to the front of it using painter’s tape, so it doesn’t get in the way. Dirt on the floors of your home can cause friction during the moving process, which makes moving the fridge more complicated. Having clean floors helps prevent scratches to your hardwood or laminate from small rocks and other debris. Now is also the perfect opportunity to clean the floor under the fridge, since it has probably been a while since you have been able to do that. You want to make sure that you have all the equipment necessary to begin moving. For moving a fridge, you will want to rent an appliance dolly or handcart. You’ll also want to invest in two subfloor panels that you’ll lay in front of the fridge, so you can walk the fridge away from the wall before securing it to the appliance dolly. Depending on the type of floor you have, you may want to consider getting plastic flooring that is designed to protect your existing floors from heavy objects while moving. Alternatively, you can create plywood and carpet squares using pieces of plywood and carpet remnants. Place the carpet side facedown on the flooring. The carpet between the plywood and your flooring prevents damage to the floor underneath as the appliance moves, while the harder surface makes the appliance easier to move. Pivoting or dragging the refrigerator can gouge or damage your floors. Instead, lay your two subfloor panels perpendicular to the front of the fridge in front of the legs. Then, scoot the refrigerator onto these panels. Once the fridge is pulled out from the wall, lift it slightly on one side so that you can slide the hand truck under the appliance. Then, wrap a strap securely around the middle of the refrigerator and fasten to the dolly. Moving an appliance on your own is unsafe. Having a friend or family member will make it easier and safer, as you’ll need someone to assist you with maneuvering the dolly to the moving truck. Hiring a professional appliance mover is also an excellent option. It could be cheaper to hire help than to replace your floors or refrigerator if you cause accidental damage. 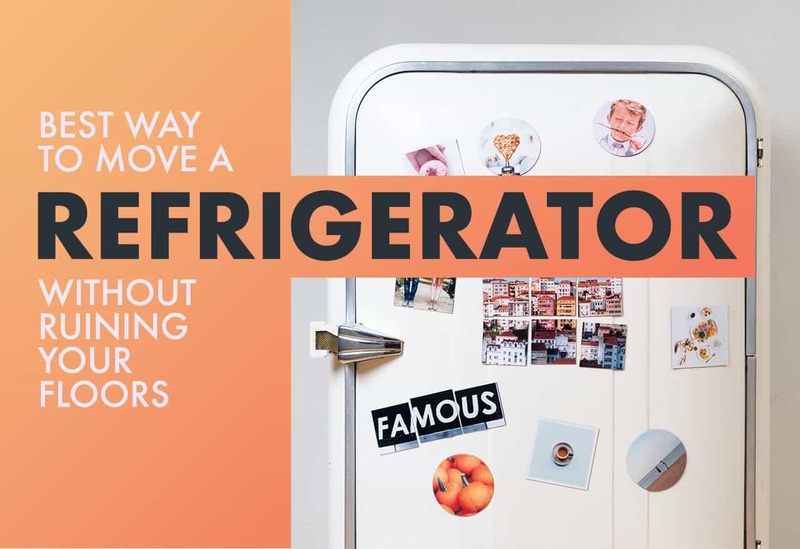 Additionally, the professional moving company has the needed equipment to move the fridge properly, so you won’t have to rent or purchase these tools. If you need help finding trusted pros in your area, contact greatguyslongdistancemovers.com to find a moving company you can count on.